Enow Abrams and Essousse Erik were in Buea Friday, June 22, 2018 to mobilise staff ahead of expected national elections. 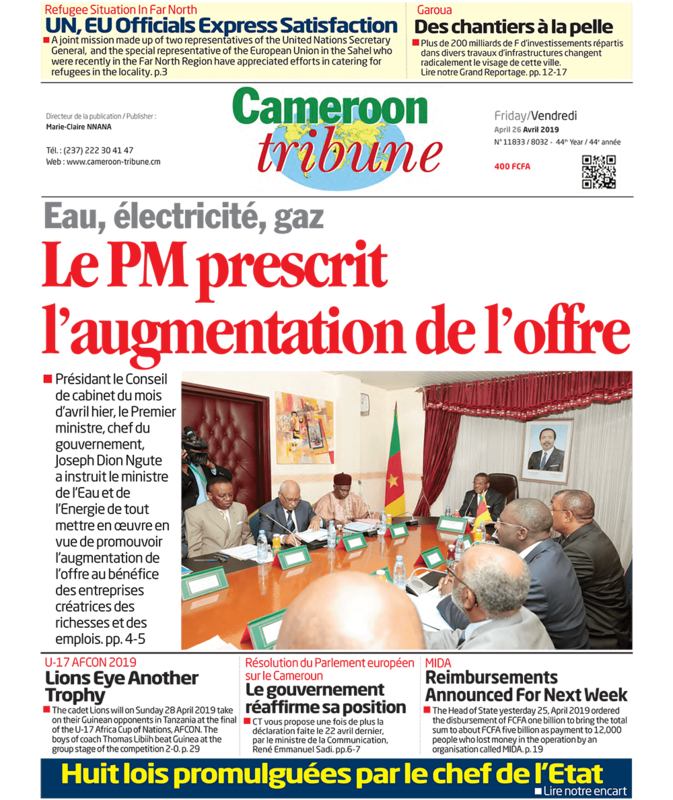 The 241 regional staff members of Elections Cameroon (ELECAM) in the South West Region have been assured of their career advancement, their National Social Insurance Fund (NSIF) dues, work bonuses and a new career protection system. Enow Abrams Egbe, Electoral Board Chair, accompanied by Essousse Erik, new ELECAM’s Director General of Elections, made the promises while addressing their Regional personnel on June 22 in Buea. 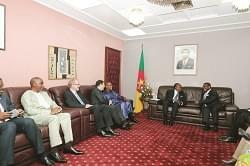 The authorities of the Cameroon’s electoral body underscored that both deliberative and executive arms of ELECAM undertook the joint mission to Buea to give a new image of a new ELECAM, united and stronger than ever before. The Electoral Board chair added that in the wake of the appointment of a new Director General of ELECAM, it was necessary to come and live the reality on the ground, with a new dynamic spirit put in place. “There is only a one and indivisible Elections Cameroon”, Mr Egbe reminded the audience. He assured that the ELECAM team of officials and Board members was on a nationwide tour to meet the staff and strengthen institutional solidarity ahead of the expected October 2018 electoral consultation. As a first gist of the form that the coming elections may take, it filtered from authorities that ELECAM would move from polling stations to voting centres in vulnerable areas. While in Buea, the ELECAM Officials paid a courtesy call on the Regional Governor, Bernard Okalia Bilai, to stress the necessary collaboration with the administration like other national forces aiming at smooth and credible electoral conduct. The local staff of ELECAM from the various territorial Divisions of the South West led by their interim Delegate, Mewanu Divine Mokoto, assured the visiting authorities of their new spirit to toe the line as well as their determination to brave ground odds to keep ELECAM floating. The South West Delegation of ELECAM has registered 9,443 eligible voters so far in 2018 bringing the total number to 398,015 voters. Of this number 395.910 cards have been received for distribution in the Region with 381,169 voter cards now in the hands of potential voters. Meanwhile, 11,530 voter cards from 2012 to 2015 have been returned to Yaounde as unclaimed. At the moment, 3,211 waiting cards are available in the South West ELECAM branches pending collection. As Mewanu Divine, interim ELECAM Regional Delegate, reported to the visiting authorities, current teething troubles are affecting ELECAM in the South West Region exacerbated by killings and threats on the life of ELECAM staff. The recent murder of Tchonang Elie Roger, ELECAM head for Kupe Muanenguba Division, by an unidentified gang was mentioned.